Preventative Maintenance: We offer both residential and commercial preventative maintenance agreements for homes and businesses of any size. Duct Work: We will design and service your duct configuration for your heating systems. We are Trane Certified and can design the specific duct that you need. We also provide duct cleaning services and maintenance for your home. 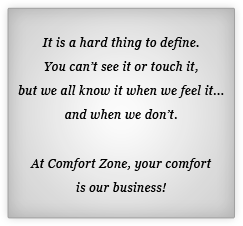 EarthWise™ Design Approach: Our Comfort Consultants understand the importance of energy conservation. We take the time to educate home and business owners on Trane's EarthWise™ Hybrid Systems to help lower your heating & cooling costs, while helping our planet at the same time. Call us for a free consultation!